As the largest state in the U.S., Alaska offers unlimited opportunities for exploration. It would be impossible to experience it all in a day or two, so here are some absolute MUST things to do, see, and eat. Then by the end of your trip you can truly say you have experienced Alaska! See the Northern Lights: Seeing the Northern Lights, or the Aurora Borealis, is a sight unlike any other. Whether it’s the 1st time or the 10th, it never ceases to amaze the human eye. Your chance of seeing colors dance in the sky is greater between the cold months of September and April than at any other time. Immerse Yourself in the Wild Outdoors: What is a trip to Alaska without getting up close and personal to its spectacular beauty? Whether you take a helicopter and walk on a glacier, raft down a river, hike through wildflowers, or watch whales, every bit of Alaska has beauty to offer. Get close to some of the most popular glaciers such as Tracy Arm Fjord, Mendenhall Glacier, and Hubbard Glacier and experience a sight like no other as parts of the ice break away and crash into the ocean. And if you love fishing, you have come to the best state. Some tours will even prepare the fish you catch in order for you to take it home! Pan for Gold: Remember reading about the Gold Rush in your history books? Well, now it’s your turn to pan for some gold. Glimpse firsthand what it was like for thousands of people in the late 1800’s who flooded to the banks of Alaska to search for gold. Whether you discover gold or not, it’s the experience of a lifetime. Visit the Totem Bight State Historical Park: No matter where you go on your travels, learning about the history and culture of a place gives you the opportunity to understand and appreciate the people and destination. 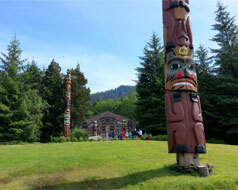 Visit the Totem Bight State Historical Park to learn about Alaska’s heritage and indigenous population. Iditarod Race: The famous Iditarod Race may just become your new obsession. If you are lucky to have booked a stay during the actual dog sled race, then watch a team of dogs mush out for the race of a lifetime (The race begins in Anchorage, Alaska.). If not, take the time to learn all about Iditarod race dogs by catching a ride with a sled dog team or be the one to mush a team of dogs through the great Alaska terrain. See how the dogs are trained and prepared or try your hand at dog-mushing. Eat Alaskan Specialties: Alaska may not serve up delicacies like Escargot, but you can still pile your plate up with mouth-watering seafood specialties such as Wild Alaskan King Crab Legs, fresh Kaachemak Bay Oysters, and BBQ Wild Alaska Halibut. If you’re not feeling like seafood, then have your taste buds sample Caribou Chili, Moose steak, or Reindeer Sausage Stir Fry. After dinner, grab a slice of Gooseberry Pie along with Akutaq (Eskimo Ice Cream) for dessert!